Aside from the early use of oxen, horses were the primary means of mechanical power on farms in San Juan County. 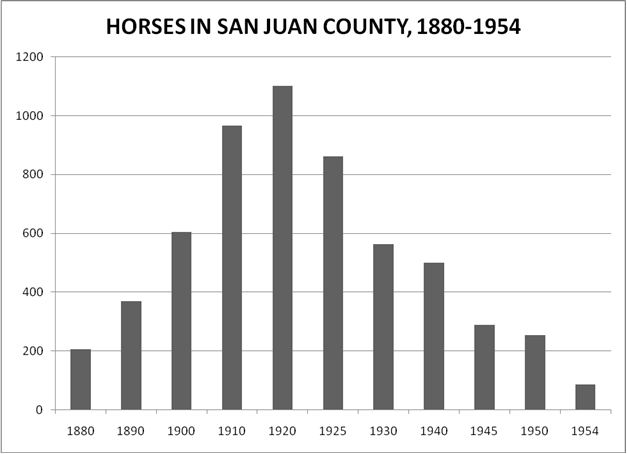 Based on federal census of agriculture figures, the average number of horses per farm in San Juan County was about 2, which would suggest that most farms only had a single team. Tractors were introduced to the islands as early as 1924, but most farms continued to use draft horses prior to the World War II. After reaching a high of 1,102 in 1920, the number of horses and mules in the county declined in the next several decades, but was still just below 500 in 1940. However, it dropped precipitously after the War (1945) to 288; by 1954 there were only 85, and five years later none were recorded in the federal agricultural census. There appear to have been very few barns specifically dedicated to horses in the San Juan Islands, probably because of the low number of teams on farms. Most ‘general use’ barns incorporated stalls for work horses.